In this article you will find a few expressions to be able to communicate in daily life in Jordan. Here is some useful advice about preparing your suitcase so you don't forget anything. Here you have it, a summary of everything you need to know before heading to Jordan. Jordan is a pleasant place to go all year round. It is very hot in summer so you may prefer autumn or spring. You will need a passport that is valid for 6 months after you enter the country. A visa is obligatory and can be obtained at the airport or land border crossings (except the Allenby/King Hussein Bridge). There are no obligatory vaccines. But you are advised to make sure your Typhoid and Hepatitis A are up to date. The price of a return ticket can vary according to the date of your trip to Jordan, when you buy your ticket, and the airline. Jordan is 2 hours ahead of Washington. When it is noon in Washington it is 2 p.m. in Amman. The kingdom's official language is Arabic. Howver, people in the tourist business, and a majority of the population speak English. Plugs are 220 volts. So you will need an adapter. 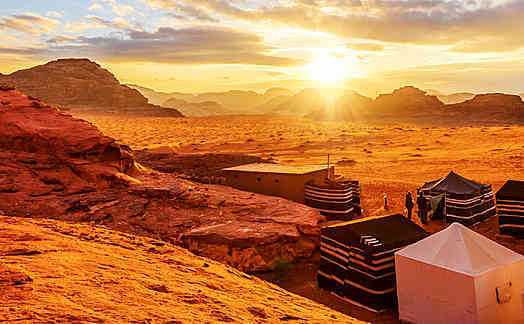 In this article, you will find everything you need to know in order to get into Jordan. This article provides an overview of the security situation in Jordan and the steps you can take to avoid potential problems. In this article you'll find all the information you need to get a better idea of the budget you'll need for a trip to Jordan. In this article you will find a section on the basic principles of Islam. To be revised before going to Jordan. In this article you will find some tips on etiquette and the different rules of politeness to follow in Jordan.